For dates in 2020, read Disney Cruise Line Announces 2020 Dates for Star Wars and Marvel Days at Sea. (4:25 p.m. EST) -- A galaxy far, far away awaits cruisers on select Disney Fantasy sailings in 2019. Disney Cruise Line has revealed it will extend its popular Star Wars Day at Sea program through 2019, with the addition of nine cruises -- each of which will include a Star Wars-themed sea day complete with special programming and restaurant menus. 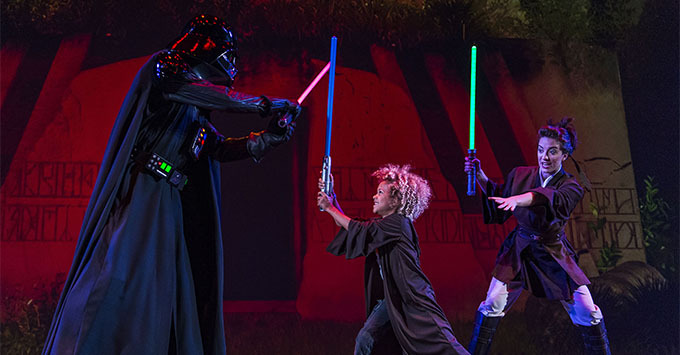 Family-friendly activities include Star Wars character meet-and-greets, movie nights (featuring new releases), Star Wars trivia and a Jedi training show where kids can learn lightsaber skills and battle Darth Vader. Throughout the day, restaurants and bars also will serve themed foods and cocktails. The sea day will end with a fireworks show and deck party, hosted by Star Wars heroes and villains. Western Caribbean: Cozumel, Mexico; Grand Cayman, Falmouth, Jamaica; and Disney's private island in the Bahamas, Castaway Cay. Departure dates include January 4, January 19, February 2, February 16 and March 2. Eastern Caribbean: Tortola, St. Thomas and Castaway Cay. Departure dates include January 12, January 26, February 9 and February 23. All cruises span seven nights and depart from Port Canaveral (Orlando), Florida. In addition to Star Wars Day at Sea cruises, Disney Cruise Line revealed a handful of Marvel Day at Sea cruises would be offered on Disney Magic, between January and March 2019.